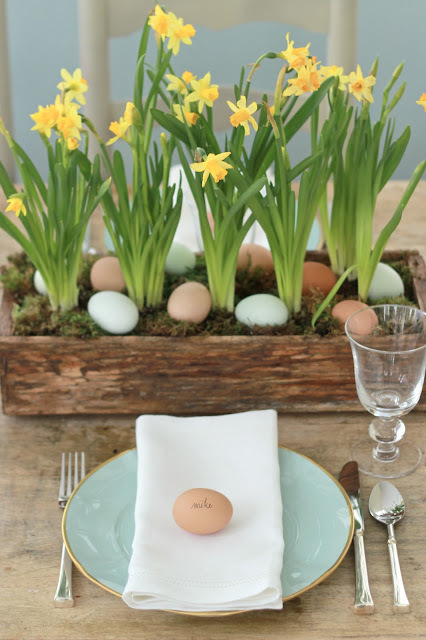 Last week I posted a Spring table setting that featured bowls of heirloom blue and brown eggs lined up with bowls of planted daffodils down the center of the table. I decided to make another setting with the same 'ingredients' inspired by my planted paperwhites from the Holidays. I used the same wooden box in which the paperwhites were planted and I 'hid' the blue and brown eggs nestled in the moss. I love that it is so simple, but seems whimsical at the same time - almost like a little patch cut out of someone's garden on Easter morning. For a really easy place card, I wrote names on the brown eggs with a black fine point Sharpie. I love simple table settings like these - they seem so fresh and understated but have lots of style. Don't you think? What will you be using to dress your Easter table? This is lovely! Love the soft pastel colors. Can't wait to recreate when I have my own home. Thanks for the inspiration. I adore this idea and the whole table is beautiful...love the blue plates! Nice idea you've share to us. Would love to know where the glasses are from as well. Thanks!